Prehospital care in Australia is slowly evolving, from the current traditional paradigm of protocol-driven care delivered by vocationally trained providers to safe clinical care based on the evidence of improved patient outcomes, dispensed by tertiary educated, registered practitioners. This fundamental change in system-wide practice is hampered by the various challenges of vast geographical distance, fiscal constraint, paucity of robust data and a lack of political will and understanding of the critical importance of evidence-based policy. Australian Commission on Safety and Quality in Health Care, Governance. (2014). http://www.safetyandquality.gov.au/about-us/governance/. Australian Government Department of Communication. (2012). Broadband availability and quality report. 2012 Dec. http://www.communications.gov.au/__data/assets/pdf_file/0018/212535/Broadband_Availability_and_Quality_Report.pdf. Bange, R., & van Biljon, W. (2012). Paramedic registration: A progress report. Paramedics Australasia, WA Chapter. 2012 Sept 12. http://www.paramedics.org.au/content/2012/09/Paramedic-Registration-Report-0609.09.pdf. Blacker, N., Pearson, L., Walker, T. (2009). Redesigning paramedic models of care to meet rural and remote community needs. Paper presented at: 10th National Rural Health Conference. Proceedings of the 10th National Rural Health Conference, editor Gordon Gregory, Cairns Qld, 17–20 May 2009. Canberra: National Rural Health Alliance, 2009. http://ruralhealth.org.au/10thNRHC/10thnrhc.ruralhealth.org.au/papers/docs/Blacker_Natalie_D4.pdf. Middleton, P. M., & Malone, G. (2010). 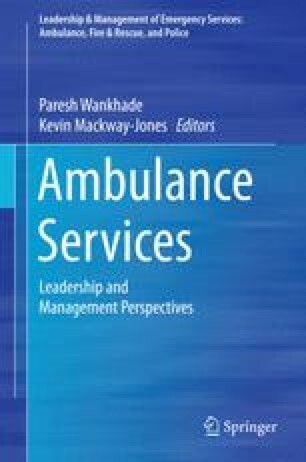 Best clinical practice in the management of the acutely ill or deteriorating patient—A pre-hospital care perspective. Paper presented at: Recognising and responding to clinical deterioration: solutions for safe care. Meeting of the Australian Commission on Safety and Quality in Healthcare; 2010 Nov 8–9: Adelaide, Australia. Accessed at: http://www.safetyandquality.gov.au/wp-content/uploads/2012/11/438781.pdf. New South Wales Department of Health. (2008). Submission to the legislative council, general purpose standing committee no.2 the management and operations of the ambulance service of NSW. 2008 July. http://www.ambulance.nsw.gov.au/Media/docs/081020councilreport-83758ed3-d308-46ff-8a4d-0882822581fa-0.pdf. New South Wales Health: Ambulance Service of New South Wales. Extended Care Paramedics. http://www.ambulance.nsw.gov.au/about-us/Paramedics.html. Paramedics Australasia. (2012). Public risk and public regulation: Response to the Australian health ministers’ advisory council consultation paper: Options for the regulation of paramedics. 2012 Sept. http://www.paramedics.org.au/content/2012/09/PA-Submission-on-paramedic-registration-03082012.pdf. Public Health, Seattle and King County. (2014). King County has world’s highest survival rate for cardiac arrest. Updated Monday, May 19, 2014. http://www.kingcounty.gov/healthservices/health/news/2014/14051901.aspx.